This entry is in Italian, for no particular reason. Ti amo, ti voglio, e piacere come ti chiami? ma chi sei in fondo di tutto questo colore? Ma quanto è strana la vita! As many of you know, the Emilia Romagna region (famous for production of Prosciutto di Parma and Parmigiano Reggiano) of Italy was hit bad last month by a series of relentless earthquakes. 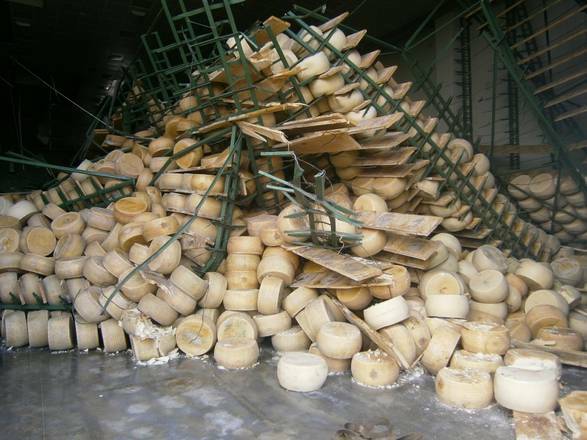 May 20th and 29th were bad days in the world of cheese producers, as years of careful aging and hard labor toppled to the ground. 300,000 wheels (amounting to roughly 10% of annual production) have been irreparably destroyed. What does this information say about the market? For those of you who are unaware, the rise and fall of price in Parmigiano Reggiano is monitored as closely as the NYSE. Weekly, a private Italian dairy consulting firm (www.clal.it/en) produces a stock market-esque analysis of the supply/demand chain of prices for all forms of cheese and dairy products in Italy. 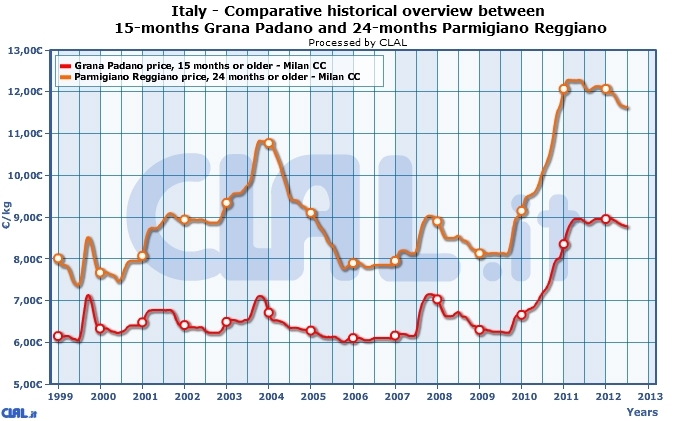 The top line representing Parmigiano Reggiano, you can see that prices in 2011/12 are above 12 Euro per kg (roughly $8/lb) in ITALY! At Whole Foods this dairy gold sells for over $20/lb. While prices are suspected to fall in 2013, based on the simple laws of supply and demand it will take roughly 2 years to replace the destroyed product. Being a salesman for imported Parmigiano Reggiano, this is not good news for me. Will Parmigiano Reggiano retain it’s standing title as the “King” of cheeses? Most likely… it seems people will always pay to be satisfied…the joys of niche markets!